On the back of chilling news of mass layoffs at home grown E-Commerce Unicorn Snapdeal and a “reboot” at homestays aggregator Stayzilla, Venture Capital investment activity hit a five month low in February 2017, down for a third month in a row. Venture Intelligence tracked 32 VC investments* worth $241 million in February. The activity or number of investments were 20% lower compared to the same period last year as well immediate previous month and 36% lower than the average activity levels witnessed in the Oct-Dec quarter. (*Seed to Series D round investments of up to $20-M in companies less than 10 years old. The monthly analysis includes investments of over $20-M as well in tech startups that are less than 10 years old.) Except for a minor uptick in the Series B category, investment volumes were either flat or lower across all other rounds. The largest VC investment in the period was the $54 million raised by Cartrade.com led by existing investor Temasek – the same company had raised $145 million in January 2016. Furniture e-tailer UrbanLadder.com was another company that raised an “inside round” (i.e., from existing investors) of $15 million, compared to the $50 million it raised previously in April 2015. Enterprise Software companies – including Cloud1 Enterprises, HyperTrack, Fyle Technologies, Belong and Sigtuple - continued to get the favourable attention of investors in February. 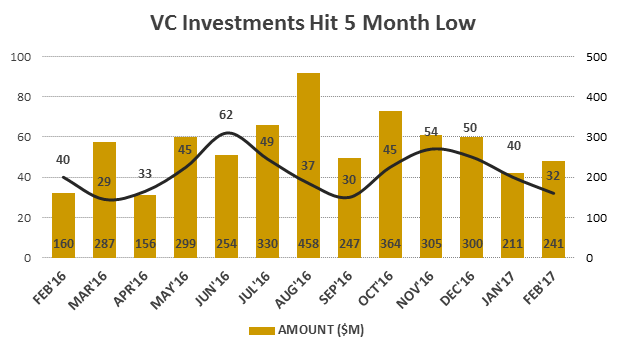 Angel investments continued to slide to register a 14 month low at 21 transactions in February 2017. The ET-Now Startup Central show, anchored by Chandra Srikanth, carried a debate on the latest VC numbers compiled by Venture Intelligence featuring IDG Ventures India Co-founder TCM Sundaram and active angel investor Sanjay Mehta. Venture Intelligence is India's longest serving provider of data and analysis on Private Company Financials, Transactions (private equity, venture capital and M&A) & their Valuations in India. Catch more Venture Capital related debates at Venture Intelligence's APEX'17 PE-VC Summit in Bangalore on March 22.